Codemotion team is happy to announce the first Google & Codemotion Diversity Initiative! Codemotion is strongly committed to creating a welcoming environment for everybody. Also, we wish to support members of underrepresented groups who may not otherwise have the opportunity to attend our conference for financial, social or any other reasons. This includes (but is not limited to): people of colour, LGBTQIA+ people, women and disabled people. 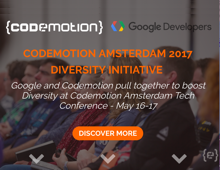 Thanks to Google, who share our same awareness on Diversity, we are happy to provide 30 complimentary tickets to boost the Diversity in Codemotion Amsterdam Conference! The Google & Codemotion Diversity initiative helps emphasize our goal of fostering a technology community that accepts and promotes diversity. If you are eligible to apply, please drop a line and explain why do you want to attend to Codemotion!